The Howth gunrunning: Molly Childers and Mary Spring-Rice aboard the Asgard. 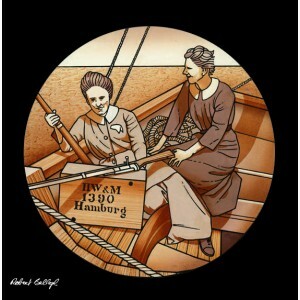 The artist depicts Molly Childers and Mary Spring-Rice on Erskine Childers’s yacht the Asgard, seen as through a telescope off the coast of Dublin. Here, Ballagh reinterprets a well-know image, taken from a photograph and first published in F.X. Martin’s The Howth gunrunning and the Kilcoole gunrunning, 1914 published in Dublin in 1964. High-quality Giclée print.